The European Parliament sealed the new rules on ending roaming charges in June 2017 and the first EU-wide net neutrality rules. The European Commission welcomes today's vote by the European Parliament's plenary to adopt the agreement reached in June to end roaming charges by June 2017 and to set first EU-wide net neutrality rules (read the press release). The roaming charges will cease to exist in the EU as of 15 June 2017. Consumers will pay the same price for calls, texts and mobile data wherever they are travelling in the EU. Calling a friend when you are at home or in another EU country won't make a difference on your bill. 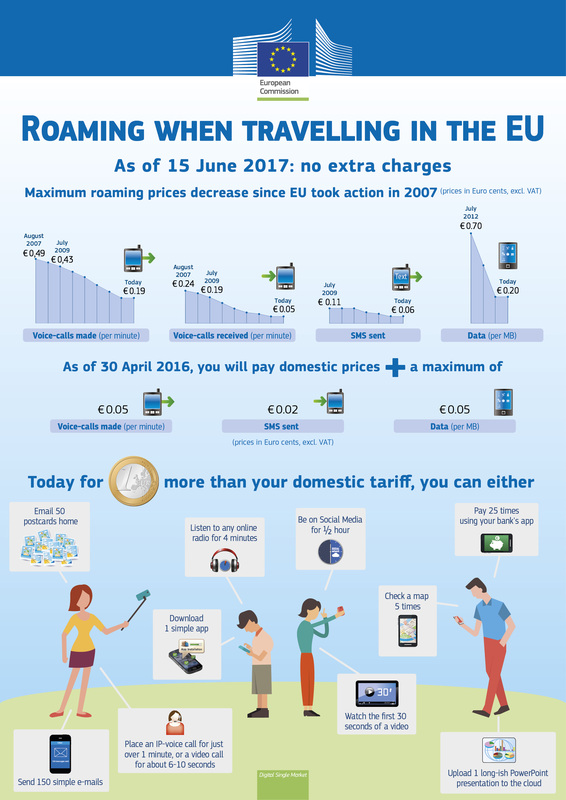 Already from April 2016, roaming will become even cheaper: operators will only be able to charge a small additional amount to domestic prices up to €0.05 per minute of call made, €0.02 per SMS sent, and €0.05 per MB of data (excl. VAT). 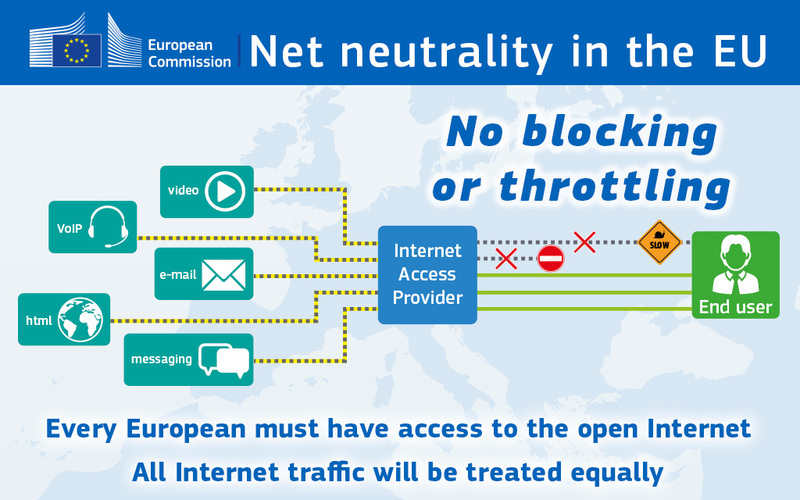 The rules enshrine the principle of net neutrality into EU law: no blocking or throttling of online content, applications and services. It means that there will be truly common EU-wide internet rules, contributing to a single market and reversing current fragmentation. Every European must be able to have access to the open internet and all content and service providers must be able to provide their services via a high-quality open internet. From the entry into force of the rules, blocking and throttling the internet will be illegal in the EU and users will be free to use their favourite apps no matter the offer they subscribe. Many mobile providers are blocking Skype, Facetime or similar apps or sometime they ask extra money for allowing these services: this will be illegal. All traffic will be treated equally. This means, for example, that there can be no paid prioritisation of traffic in the internet access service. At the same time, equal treatment allows reasonable day-to-day traffic management according to justified technical requirements, and which must be independent of the origin or destination of the traffic and of any commercial considerations. Common rules on net neutrality mean that internet access providers cannot pick winners or losers on the internet, or decide which content and services are available. The European Commission presented its proposal for a telecoms single market ('Connected Continent') in September 2013 (press release). The European Parliament voted on its first reading of the draft legislation in April 2014 (press release). The Council adopted a mandate to negotiate in March 2015 under the Latvian Presidency (press release). Negotiations led to an agreement on 30 June (press release and Q&A) which was formally adopted by the Council on 2 October and by the European Parliament today. The measures adopted today will be completed by an ambitious overhaul of EU telecoms rules in 2016. This reform will include a more effective EU-level spectrum coordination. Creating the right conditions for digital networks and services to flourish is a key objective of the Commission's plan for a Digital Single Market presented in May 2015.